Determine when your app is online or offline or in a metered connection by using the Connection signal object. Leverage existing formulas such as LoadData and SaveData for basic data storage while offline. The first thing to discuss is how PowerApps applications access data. The primary mechanism for PowerApps applications to consume data is through a set of connectors provided by the platform such as SharePoint, Office 365 and the Common Data Service. You can also build your own custom connectors that can allow you to build any custom logic and capabilities as well as run them anywhere (such as using Azure Functions). The connectors are accessed over the internet using HTTPS which means your users will need to be online for them to access this data or functions that they offer. 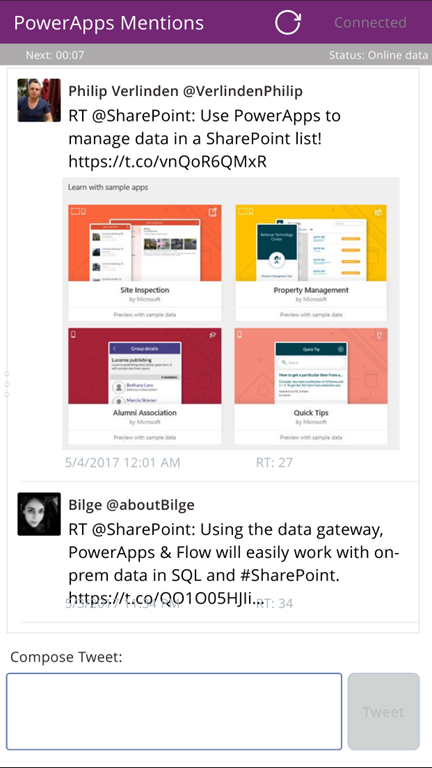 One of the interesting aspect of PowerApps is that it offers a set of capabilities and formulas that allow you to filter, search, sort, aggregate, insert and manipulate data that is consistent regardless of the data source such as if you are using a SQL database, a SharePoint List, a Common Data Service entity, or even collections that are locally stored the device. This allows us not only to easily build applications that can be retargeted to use a different backend but also that can be modified to use local collections instead with almost no changes to the logic. When dealing with offline data, local collections will be the primary mechanism that PowerApps offers today. To keep the focus on the offline aspects and showing some of these new capabilities we are going to keep the scenario very simple. In this case, we are going to build an application that allows you to read twitter posts while being offline as well as tweet while being offline and when the application comes online the tweets will be posted and the local data will be reloaded. Click Content—>Data sources and choose Add data source on the data sources panel. Click New Connection and select Twitter and click Create. Enter your credentials and create the connection. Load the tweets on the startup of the app. 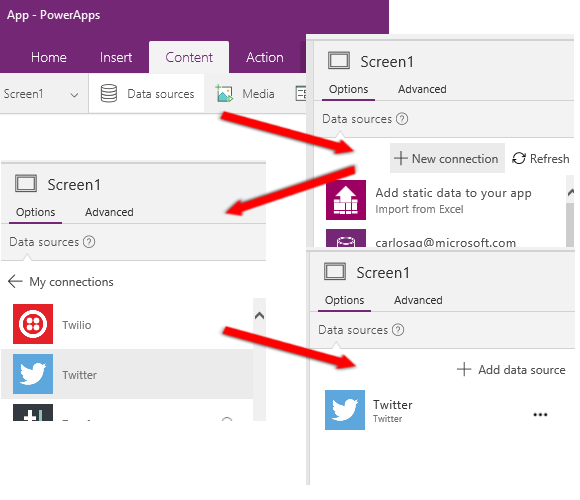 This formula checks if we are online, if we are it will Load into a “LocalTweets” collection up to 100 tweets with the search term “PowerApps”. If offline, it will load the local cache if available from a file called “Tweets”. This formula checks if the device is online, if it is the text of the label will say “Connected” otherwise “Offline”. This formula checks if we are online, if we are it will tweet the text immediately. If we are not, it will capture the tweet in a “LocalTweetsToPost” collection and save it to the device. Then it resets the text in the text box. Finally, we will add a timer to post any tweets that may be available in the collection pending to be posted. This formula verifies if the device is online and if it is it will Tweet all the items that are in the “LocalTweetsToPost” collection. Then it will clear the list. With this release of PowerApps you can now run PowerApps and launch apps even while being offline. However, to be able to run an application you must run it at least once while being online so we can download the app. Write a new Tweet. It will be stored locally in the collection. Exit Airplane Mode, and at this point after 30 seconds once the timer triggers, the tweet will be posted. Avoid network calls when offline. Today when you launch PowerApps we still attempt to download the list of apps and other processing that is not necessary while offline. We will remove these which will avoid some delays while running apps offline. We hope you will find this capability useful. Over time we will also invest on providing you with better ways to handle conflicts, error handling for network calls, and more. 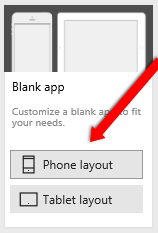 As always, please provide feedback in our forum and share your examples of offline apps in the PowerApps community blog.